Hi! 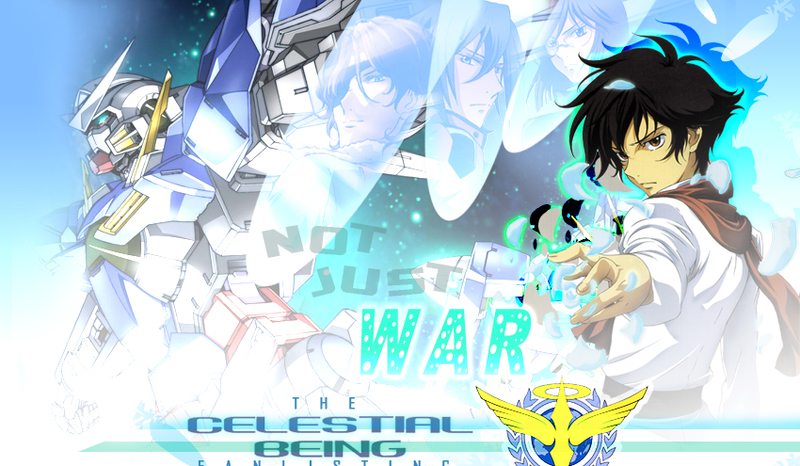 Welcome to "Not Just WAR", the TAFL approved fanlisting for the Celestial Being, the team from the series Kidou Senshi Gundam 00 that uses terrorism in order to bring peace into the world! They use innovative Mobile Suits called "Gundam", that exploit a special system called GN Drive. Even if the Celestial Being are considerated terrorists, they fight with all theirselves for a better world. Setsuna F. Seiei, Lockon Stratos, Allelujah Haptism and Tieria Erde are the four selected pilots that together with a vanguard equipe, do their best sacrifing everything, themselves too if necessary. This is the second version I made for this fanlisting and I want to thank you very much my sweet sister Miriallia , that helped me a lot with many aspects of the graphic. A big hug to her! Please choose a link from the right to fully access this site and if you're a fan of the Celstial Being, feel free to join their fandom! Sunrise, Konami and MBS TV, all rights reserved. This is a fan-site and I don't intend to violate them. Layout and contents are © Dorothy, do not reproduce..